In the span of about five years, Jimmy Fallon went from a “Saturday Night Live” alum unsuccessfully navigating Hollywood to a late night star to the host of NBC’s “The Tonight Show,” one of the most respected franchises in entertainment. It’s not by accident. Fallon’s meteoric rise is partly due to his intense focus on developing relationships with people who could advance his career, according to Shane Snow’s book “Smartcuts” and a recent interview with the comedian. And he proves that this type of networking doesn’t have to be some kind of Machiavellian manipulation, but rather can be based on a genuine interest in personally connecting with influencers. Fallon’s career began with this drive. While still a computer science major at Albany’s College of Saint Rose, he performed comedy at small clubs and obsessed about the comedy industry. Fallon had interned at a New York alt-weekly, and his former boss Peter Iselin passed on his audition tape to one of his new colleagues in Los Angeles, entertainment agent Randi Siegel. Siegel was only 26 but managed to make her way into the SNL crowd with clients like David Spade and Adam Sandler. Siegel was impressed by his knowledge of the comedy industry coupled with his enthusiasm and agreed to take him on as a client. He was so dead-set on joining SNL that he dropped out of school one semester shy of graduating. Due to Siegel’s connections, Fallon was able to eventually get two SNL auditions even after bombing the first one. He was hired as a cast member in 1998. At SNL, Fallon developed the relationship that would come to define his career. The show’s creator, Lorne Michaels, is so powerful and respected in the industry that he often intimidates cast members. As a rookie, Fallon was no different, but he wanted to let Michaels know how much being part of the show meant to him. SNL producer Marci Klein took a liking to Fallon and recommended that he make his way into Michaels’ exclusive SNL after parties. Fallon tells Men’s Journal, “Marci gave me a bit of advice: ‘After every show, go over to Lorne and you thank him for the show.’ And I did. I thanked him every single show.” After a few weeks of this, Michaels invited him to sit down and have a drink with him and a coterie of celebrities. Within a few seasons, Fallon habitually joined Michaels after every show to go over the night’s performance. Michaels developed a rare friendship with Fallon. “There’s some kind of very strong connection. I can’t really describe it beyond that. But it just has always been there,” Michaels tells Men’s Journal. Fallon left SNL in 2004 to pursue a movie career, and after a few flops, he felt stuck. When the late night world started to shift, Michaels convinced Fallon to take Conan O’Brien’s vacated seat on NBC’s “Late Night” in 2009. After “The Tonight Show” drama of O’Brien’s short stint as host and Jay Leno’s return, Michaels decided that his trusted Fallon would take the renowned position. Fallon made a point of connecting with Leno while he was host of “Late Night,” and would call him to ask for advice. Leno says their conversations gave him insight into what made Fallon so successful in such a relatively short time. “Most people in show business think they know everything. They don’t really listen to the other person. They just wait for the other person to stop talking. Respectful is the best word I can use for Jimmy,” Leno tells Men’s Journal. Fallon sees no need for bad blood with anyone. He speaks highly of his competitors Stephen Colbert and Jimmy Kimmel, and he broke Johnny Carson’s decades-old “Tonight Show” ban of the late Joan Rivers due to a perceived betrayal. His approach has worked. Since starting in February 2014, Fallon has attracted around 4 million viewers each night, with a much higher share of the 18-49 demographic than his predecessor, helped by many of his skits going viral on YouTube. Fallon doesn’t see his ascension to the coveted late-night seat as the result of careful strategising. “I just kind of did what I do. Maybe Lorne was playing the chess game more than I am. I could be just a piece that he’s playing. But if he is, it’s a great move for me. 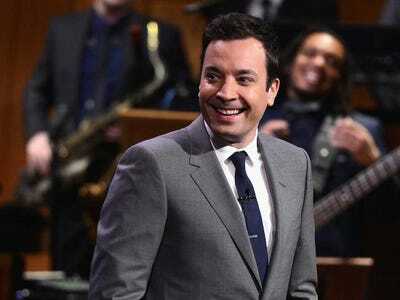 We’re both winning,” Fallon tells Men’s Journal.